A great quality unit, Ideal for WC, Shower and Basin. Complete with waste pump connection fittings and blank off's. 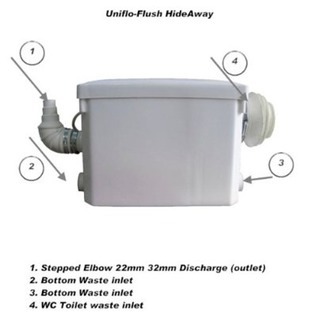 Uniflo/HideAway is suitable to be installed as a stand alone unit for just a WC or a combination of all above. Conceal behind a false wall cavity or a cupboard. Side WC inlet for easy installation. A good alternative to Saniflo, 22mm discharge outlet pipe, Very low level waste inlets. Sensibly Priced. Fully Automatic. . Modern Design. . Install a Toilet, Basin or Shower virtually anywhere in the home. . Very Easy to Install. . Discharge Outlet Pipe set at 22mm. (This can be increased to 32mm if required) . Very Low Level Waste Inlets, Left and Right. . Built in Non-Return Valves. . Side Entry WC Inlet Waste. . 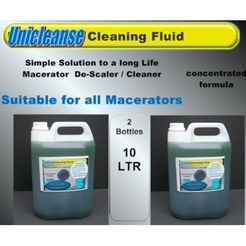 Suitable for use with a washing machine or kitchen Sink. . Conceal behind a Wall Cavity or cupboard. . Easy to maintain. Tech Specification. rated voltage 230/240v. rated power 400 watt. flow rate Input 14.5ltrs per min. Output Flow 240lts min. max discharge height 5.0mts. max horizontal length 60mts. comes with GS, CE certificate. Unit size approx 400mm wide, Height 260mm, Depth 180mm. 12 Month UK Based warranty.